General Robertson's plan for moving his 2d Division south was to "skin the cat," pulling the most advanced battalions in the Wahlerscheid sector back through the others. In addition to the main supply road, a part of the division could use the secondary route running more or less parallel to the Wahlerscheid road until the two met at a fork about a mile north of Rocherath. (See Map II.) The 395th Infantry was in the woods east of the northernmost section of the 2d Division withdrawal route and would provide cover for the first stage of the tricky move parallel to and close behind the rapidly deteriorating front. Then too the enemy at the Wahlerscheid road junction seemed hardly strong or aggressive enough to make even a daylight disengagement difficult. The danger zone would be the twin villages. Roads from the east led into Rocherath and Krinkelt. And, to the east, as information from the 99th Division rifle battalions warned, the Germans had made a deep penetration and were liable at any moment to come bursting out of the forest. Rocherath and Krinkelt had to be held if the 2d Division was to reach the Elsenborn position intact and with its heavy weapons and vehicles. The 99th Division had long since thrown its last reserve into the battle; therefore the 2d Division (with the attached 395th) alone had to provide for the defense of this endangered sector of the corridor south. The 2d Division commander assigned responsibility to his officers as follows. 1 Col. Chester J. Hirschfelder, commanding the 9th Infantry, was charged with the actual withdrawal from Wahlerscheid. The assistant division commander, Col. John H. Stokes, Jr., took over the defense of Rocherath. Col. Philip D. Ginder, assigned to the division as a spare regimental commander, was given the task of establishing a blocking position southeast of Wirtzfeld-the village at which the 2d Division would have to turn toward Elsenborn. General Robertson himself would spend the crucial hours of the 17th working up and down the Rocherath road, gathering additional troops where he could, intervening to change the disposition of battalions and even companies as the complexion of the battle altered. occupy their assigned positions and entrench before the enemy struck. Others would have to attack in order to take their designated place in the new line of resistance. Meanwhile the rumor that American prisoners were being butchered in cold blood by SS troops was spreading like wildfire through the 2d Division, a partial explanation of the bitter fight finally made at the twin villages. Robertson's order, "withdraw at once," reached the 9th Infantry a little after 1000. By 1100 the 2d Battalion had assembled and started south, with the 3d and 1st Battalions forming in that order to complete the column. The withdrawal from the front lines, shielded by a heavy barrage laid on the West Wall positions, was accomplished readily but of course took much time. The 1st Battalion, bringing up the rear of the 9th Infantry column, did not set out until 1415. Before the five battalions at Wahlerscheid commenced to disengage, General Robertson marched his only reserve, the 3d Battalion of the 38th Infantry, south through Rocherath and Krinkelt. At this time in the morning the imminent German threat was in the area north of Büllingen. For this reason Robertson placed the 3d Battalion (-) at the southern edge of Krinkelt, where, by 1130, it was entrenched. One rifle company, plus the antitank and service companies, took positions around Rocherath guarding the roads entering the village from the north and east. move to Elsenborn, and defending Krinkelt and Rocherath until such time as both the 2d and 99th Divisions could be withdrawn to the Elsenborn ridge. The 9th Infantry, leading the move, was to concentrate the bulk of its troops around Wirtzfeld; the 38th, to build up a defensive line at Krinkelt-Rocherath as its battalions arrived. Before dark the 2d Battalion of the 9th Infantry had traversed the seven and a half miles of congested and shell-torn road, deploying south of Wirtzfeld in line with the 2d Battalion of the 23d Infantry. The 3d Battalion, next in the 9th Infantry column, arrived after dark and dug in between the two battalions already south of Wirtzfeld. En route the 2d Division commander had detached Company K and sent it posthaste to the line forming northeast of Rocherath and to the rear of the fragmented 3d Battalion, 393d. Through the afternoon the prospect of a large-scale German armored attack from Büllingen had loomed large in the calculations of both General Robertson and General Lauer. Fortunately the attack failed to come. In the late afternoon two rifle battalions were on their way to Krinkelt and Rocherath: the 1st Battalion of the 9th Infantry (Lt. Col. William D. McKinley) cleared the Wahlerscheid area at 1415; the 1st Battalion of the 38th Infantry (Lt. Col. Frank T. Mildren) started on its way at 1530. The road south was now under German shellfire, going was slow, and only a short span of daylight remained The danger involved in the movement across the front multiplied with each hour, for the 99th Division center, east of the twin villages, was collapsing. On the road General Robertson met Colonel McKinley and told him that he had just come from the command post of the 395th Infantry where he had learned that the Germans had broken through the 393d. Robertson had split the preceding battalion of the 9th Infantry to send a rifle company and part of the headquarters company to bar the main road from the forest into Rocherath. Now he ordered McKinley to rush his battalion to Rocherath and hold the woods road "until ordered to withdraw." At dusk the 1st Battalion was in position, deployed on a slight rise overlooking a shallow depression from which a gradual ascent led into the forest. A thick fog lay close to the snow-covered ground. Around was a scene of wild confusion, stragglers with and without arms hurrying along the road and across the fields, the sound and flash of gunfire coming from the woods to the east. Company K, now attached to the 1st Battalion, already was north of the road, backed up by three guns from the 644th Tank Destroyer Battalion. Company C closed beside K; Company B dug in at the road; Company A lay to the south. The battalion had not picked up its mines during the disengagement, but was able to get a few from the tank destroyers for use at the road. There were fifteen extra bazookas on the ammunition vehicles, and these were handed to riflemen earlier trained by McKinley as bazooka men. Forward observers from the 15th Field Artillery Battalion hurriedly set up their communications. In the woods, less than a thousand yards away, firing continued as darkness closed over the American position. three tanks and a platoon or so of infantry came through Company B. They had passed on toward Rocherath before anyone realized that this was the first of the enemy. Half an hour later more tanks came clanking along the road, the dark shapes of infantrymen following. This time Company B took no chances. The first two German tanks struck the American mines. Then two more tried to swing off the road, only to be knocked out by bazooka fire. By this time the Germans were milling about, apparently completely surprised, while the 15th Field Artillery Battalion added to the confusion by beating the road close to the 1st Battalion foxholes. It took the enemy an hour or so to reorganize. Then five or six German tanks attacked in line, rolling to within a couple of hundred yards of the foxhole line where they halted and fired for nearly half an hour. Next the accompanying infantry rushed in, but were cut down by the heavy machine guns on the final protective line. Finally the enemy tankers and riflemen got together in an assault that broke through. It will be recalled that the 1st Battalion of the 38th Infantry had started south shortly after the departure of the last troops of the 9th Infantry. The actual withdrawal was screened by the 2d Battalion of the 38th, the final covering force of the 2d Division, and was aided by fire and smoke laid down by the 37th Field Artillery Battalion, 81-mm. and 4.2-inch mortars. On the road the regimental executive officer met Colonel Mildren and explained the 1st Battalion mission: to go into the line forming at the twin villages on the left of the 3d Battalion, 38th Infantry, east and northeast of Krinkelt. Mildren learned in addition that the battalion probably would have to fight its way to the assigned position, a jarring note that pleased none this close to nightfall. Rocherath the battalion column came to a crossroads which had been picked as a profitable target for the enemy artillery and Werfers. Company A at the head of the column passed safely, but the rest came into a gantlet of the most severe shelling the veteran battalion ever had encountered. Company C, third in the serial, suffered most and became badly disorganized. German tanks were near the crossroads and might have cut into the American infantry had not T/4 Truman Kimbro placed mines across the eastern entry. Kimbro was killed, after having been hit innumerable times. He was awarded the Medal of Honor posthumously. The leading company, now alone, entered Rocherath at dusk but found no guides and marched on through the next village until met by bullet fire. Twice the company doubled back on its trail until finally found by the battalion executive and directed to the proper position. Company B arriving about 2130, moved in on the left of Company A but was still on the surface (not having had time to entrench) when German tanks and infantry struck from the northeast at Krinkelt. Company A, well dug in and with all its weapons emplaced, let the tanks roll past and then took on the infantry. Its neighbor, Company B, exposed and without its supporting weapons, was riddled, only one platoon managing to escape. The Company B survivors, joined by what was left of Company C, fell back to the regimental command post in Rocherath and joined the antitank company in the street fight raging there. Back at Krinkelt three German tanks with infantry clinging to their decks got into the eastern streets: with this foothold won more Germans appeared as the night went on. The fight for Krinkelt surged back and forth, building to building, hedgerow to hedgerow. Men on both sides were captured and recaptured as the tide of battle turned. 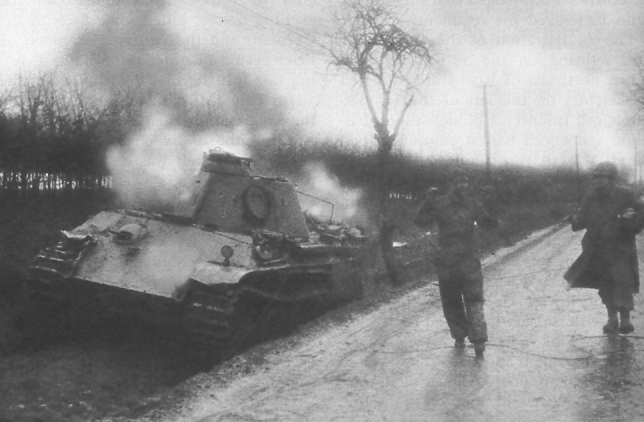 A German attempt to seize the heavy-walled church on the northern edge of the village was beaten off by the reconnaissance company of the 644th Tank Destroyer Battalion, which had lost a platoon at Büllingen during the morning. The communications officer of the 1st Battalion, 38th Infantry, 1st Lt. Jesse Morrow, knocked out a tank with only a rifle grenade. (Morrow later was awarded the DSC.) The situation in Krinkelt was further confused by retreating troops from the 99th Division, intermixed as they were with the infiltrating enemy. One German, using a captured American to give the password, got past two outposts, but a sentry finally killed both men. At midnight a column of 99th Infantry vehicles started pouring through the town and continued the rest of the night. At Rocherath, the Germans who had so boldly entered the village earlier in the evening destroyed three American tanks as these inched their way out of the village to help Company K of the 38th Infantry. Here too the fight was bitter and confused. At one time a battalion commander of the 38th was reported to have men from sixteen different companies fighting under his command. By midnight, however, the enemy tanks behind the American lines had been accounted for and the German infantrymen captured or killed. route. The rear guard 2d Battalion of the 38th had made a highly successful withdrawal and was assembled a half mile north of Rocherath. The 395th Infantry had moved back as ordered and, thus far in good shape, held the left flank of the 2d Division northeast of Rocherath astride the two approaches to the fork above the village. (It had left the 324th Engineer Battalion isolated on Rath Hill, however, and when the engineers started west on the morning of the 18th they came under fire from both the 395th and the enemy.) Straggler lines were operating around the twin villages and a start was being made at regrouping the strays and tying together the bits and pieces of the American line. Wirtzfeld, the one good escape hatch to Elsenborn, was ready for a defense in force. The 2d Division artillery and its reinforcing battalions had displaced to the Elsenborn ridge in positions within range of the entire front. General Robertson's 2d Division and attached troops had carried through a highly complex maneuver in the face of the enemy, disengaging in a fortified zone, withdrawing across a crumbling front, then wheeling from column to secure and organize a defensive line in the dark and under attack. Having completed this mission, the 2d Division was under orders to hold in place while the remnants of the 99th Division right wing passed through to Elsenborn; then it was to break away and re-form for the defense of the Elsenborn ridge. The appearance of the 2d Infantry Division at the twin villages probably came as a complete surprise to the German command. German intelligence had failed completely as regards the location of this division and believed that it was in reserve at Elsenborn. Peculiarly enough, the fact that the 2d was attacking through the 99th positions never was reported to the Sixth Panzer Army headquarters. Dietrich expected, therefore, to break through the 99th and meet the 2d somewhere to the rear or possibly to the right rear of the 99th. This may explain the German failure to attempt an end run and drive for Elsenborn. B, 612th Tank Destroyer Battalion, which Capt. John J. Kennedy had emplaced near Dom Butgenbach. The 26th Infantry (Col. John F. R. Seitz), which had been transferred to V Corps control the previous midnight, was the only unit thus far sent south by the 1st Division. At Elsenborn, after General Lauer had given a quick resume of the situation, the regimental executive officer, then in command, put the 2d Battalion in the lead, sending it south to occupy two hills midway between Butgenbach and Büllingen which overlooked the main road connecting the two villages. By dusk the 2d Battalion (Lt. Col. Derrill M. Daniel) was deployed on the high ground near the tiny hamlet of Dom Butgenbach, dug in along the reverse slopes on a 2,100 yard front. Both flanks were wide open. The enemy, however, failed to react forcefully to the American move, although a 2d Battalion patrol found that the Germans still were in Büllingen. The 26th Infantry ultimately would be hit and hit hard, but not until the German plans for shattering the eastern front of the 99th and 2d Divisions had failed. The night of 17 December passed uneventfully except for the booming of the guns of the 33d Field Artillery Battalion and 413th Antiaircraft Gun Battalion firing from their positions with the 26th Infantry against the hostile traffic streaming through Büllingen. Early the following morning small enemy detachments appeared in the Dom Butgenbach area but showed no inclination to close with the Americans. The 26th Infantry had been busy during the night completing its deployment: the 3d Battalion now was dug in west of Wirtzfeld on the left of the 2d Battalion, which retained the responsibility for blocking the Büllingen-Butgenbach road; the 1st Battalion was in reserve around Butgenbach; and considerable artillery and tank destroyer strength reinforced the command. In anticipation of an all-out German attack at this critical section of the American front, the V Corps truckhead at Butgenbach was closed and all rations and gasoline were evacuated. Farther to the west, where no defense had yet formed, the Robertville ammunition supply point, holding six thousand tons, suspended operations and moved to the rear. But through the 18th the enemy showed no sign of any earnest intent in front of the 26th Infantry. advance guards of two divisions attacking piecemeal in the dark over unknown terrain against resistance which was completely surprising. By the morning of 18 December, however, the enemy strength had increased substantially despite the miserable state of the woods roads leading to the twin villages. The 989th Regiment of the 277th Volks Grenadier Division (probably reinforced by a third battalion) had reached Rocherath. The 12th SS Panzer Division, whose tanks and armored infantry carriers made extremely slow progress on the muddy secondary roads quickly chewed up by churning tracks-was able by dawn to assemble the 25th Panzer Grenadier Regiment, an assault gun battalion, and one full tank battalion east of the villages. During the 18th this force was strengthened by one more tank battalion, the final armored commitment being about equally divided between Panther tanks and the heavy Tigers. The American strength at Krinkelt and Rocherath was substantial and by daylight on 18 December was assuming a cohesive defensive pattern as the battalions reorganized after the race south and the confused night battle. Most of the 38th Infantry (Col. Francis H. Boos) was in and around the two villages, plus about a battalion and a half of the 9th Infantry and a few platoons of the 23d Infantry (Col. Jay B. Loveless). Although these 2d Division troops had gaping ranks, so had their opponents. Fortunately in view of the number of tanks ready in the German camp, the American infantry had the means of antitank defense at hand the 741st Tank Battalion, 644th Tank Destroyer Battalion, a company of the 612th Tank Destroyer Battalion, and a few guns from the 801st Tank Destroyer Battalion. On Elsenborn ridge, but well within supporting range, lay the 2d Division artillery (which had displaced after firing from extreme forward positions), the bulk of the 99th Division artillery, and some corps field artillery battalions. The flanks of the 2d Division position at the villages were more or less covered by elements of the 9th and 23d Infantry in Wirtzfeld, to the southwest, and the battalions of the 393d deployed in blocking positions to hold the road net north of Rocherath. As yet, however, there was no homogeneous line sealing the 2d Division front, and the men and vehicles of the 99th Division still passing through to the west complicated the problem of coordinating the defense and artillery fire. by bazooka teams stalking successfully under cover of the fog. When the fog lifted about 0830, three German tanks rolled right along the foxhole line firing their machine guns while the German infantry rushed forward. Lt. Stephen P. Truppner of Company A radioed that his company had been overrun and asked for artillery to fire on his own position. For thirty minutes an American battalion shelled this area. Only twelve men escaped. Company K, which had been attached to the battalion the day before, likewise was engulfed. Capt. Jack J. Garvey, sending a last message from the cellar of the house which was his command post, refused to leave because he could not get his company out. Ten men and one officer escaped. On the left Companies B and C were able to hold their ground; a few from Company B broke and ran but were sent back by the battalion commander. The German wave carried tanks and infantry inside Rocherath, the fight eddying from house to house, wall to wall, along streets and down narrow alleys. Tanks fought tanks; men were captured, then captured again. Meanwhile, Colonel Boos did what he could to form some defense behind what was left of the 1st Battalion of the 9th.5 He radioed Colonel McKinley that as soon as the 2d Battalion of the 38th could swing into position, a matter of an hour or more, the 1st Battalion should withdraw. With his remaining two companies transfixed by direct tank fire and surrounded by German infantry, McKinley replied that no withdrawal was possible unless friendly tanks or tank destroyers arrived. "Miraculously, " as the 1st Battalion later reported, a platoon of Sherman tanks came into view. This was a part of A company, 741st Tank Battalion, which had been patrolling the Wahlerscheid road. When the platoon commander was asked if he wanted to do some fighting the reply was profanely affirmative. First the tanks joined the infantry in a counterattack to reach the positions which had been held by Companies A and K. Two of the three German tanks which had been harassing the battalion were destroyed by the Shermans, but no contact was made with the lost companies. A second counterattack by the tank platoon covered the 1st Battalion withdrawal, but the last riflemen out had the Germans yelling at their heels. gratefully acknowledged that this gallant stand had saved his regiment. The 3d Battalion of the 393d, after hard fighting on the 17th, had withdrawn northeast of Rocherath and tied in sketchily on the left of the 1st Battalion, 9th Infantry. Colonel Allen's battalion was about half strength and had lost all of its machine guns, mortars, and antitank guns. The furious morning attack against the 1st Battalion, with a tank platoon in the lead, also struck the 3d Battalion. Unable to combat the tanks although one was hit by a bazooka round, the battalion fell back a thousand yards to the northwest. Good radio communication with the 395th allowed its cannon company to take a hand effectively, covering the retirement and discouraging close pursuit. About noon Allen's men were ordered to Wirtzfeld, then on to the line forming at Elsenborn. Although enemy tanks and foot troops had penetrated as far as the 38th command post inside Rocherath, they were successfully hunted out during the morning. The Germans continued to hammer along the forest road, striving to win free entrance to the village, but they found the 2d Battalion of the 38th (Lt. Col. Jack K. Norris), now standing in the way, a tough opponent. The most successful assault of the afternoon forced the 2d Battalion to retire "one hedgerow." During the night of 18 December, the 2d Division still held the twin villages while the last organized units of the 99th Division moved west on their way to Elsenborn. In the dark, German bazooka teams crept along walls and hedgerows seeking the hiding places of the American tanks and tank destroyers which had done so much to foil the armored attacks during the day. The panzers again made forays into the villages, made their kills, and in turn were destroyed. Infantry, at 0808, stressing that the regiment was not to withdraw to Elsenborn but instead should take position south of Krinkelt beside the 38th Infantry. The main body of the 394th already had passed through Krinkelt by that hour and probably never received the order until it arrived at Elsenborn. Confused communications also had an impact in the area held by the 395th Infantry on the north flank. General Robertson, about 0200 on the morning of the 18th, had radioed the 395th Infantry to maintain contact with the 38th but to prepare for a move to Elsenborn. Thus far the enemy had made no move to strike the 395th positions in force. A radio message reached the 395th command post about 1600 ordering the regiment to withdraw to Elsenborn. The move began while Colonel Mackenzie went on to the 99th Division headquarters at Elsenborn to report. Here he was informed that no such order had been sent (it had been sent but was garbled) and General Lauer told him that his battalions must be sent back to their positions at once. Mackenzie was able to reach two battalions on the road and turn them back, but the 1st Battalion, 395th, had arrived in Elsenborn before word could reach it. The countermarch was made successfully and the old positions reoccupied at 0500 on 19 December. Information that the 395th had left, denuding the north flank, reached the 38th Infantry commander during the night and caused much concern. But the 990th Volks Grenadier Regiment, at the forest edge east of the 395th positions, either had failed to notice the withdrawal or had been unwilling to make a move with darkness settling. Ten miles by road north of Krinkelt and Rocherath the 3d Battalion, 395th Infantry, fought an isolated but important engagement on 18 December.7 Having failed the day before to breach the American cavalry line at Monschau, the 326th Volks Grenadier Division turned again toward Höfen where it had encountered such a sharp reverse on the first day of the German counteroffensive. The 2d Battalion of the 753d Regiment finally had rejoined the division; so General Kaschner put this regiment in the van, nourishing his assault waves with companies of the remaining two regiments as the fight developed. Some three hours before daybreak the German assault detachments moved forward from the hills surrounding Höfen to make a first test of the American defenses at the northern edge of the village. Well prepared for such an onslaught, concentrated artillery and mortar fire blanketed the ground over which the grenadiers had to advance. Despite heavy casualties from this fire the enemy broke through to the village. There followed a confused battle, but when day broke the last Germans were being routed from the houses. The first daylight assault came about 0900 preceded by a barrage of artillery, rocket, and mortar fire. Advancing through a thick haze, ten tanks, seven armored cars, and an infantry battalion made for the village. Once more the defensive gun concentrations made great play in the gray ranks. The 3-inch tank destroyers of the 612th Tank Destroyer Battalion, although frozen in place, held the German fighting vehicles at bay-even with the limited traverse. As before, some of the attackers broke through. Colonel Butler phoned the forward observer of the 196th Field Artillery Battalion, whose little party was fighting off Germans around its observation post (a three-story brick building right in the forward line), and asked for three five-minute concentrations on his own positions. 8 The shells came in promptly. As the fire finally lifted Butler sent his reserve, a single platoon of I Company, into the counterattack. Picking up strength at the foxhole line, the Americans drove the remaining foe back in the direction of Rohren. The German tanks, whose appearance had caused the 3d Battalion to request help "at once," took a singularly small part in the fray, retiring behind a ridge which gave shelter against direct antitank fire. It must be said that the German grenadiers were of sterner stuff. The American main line of resistance was not completely re-established until 1230. When night came the Germans tried once again but to no avail. Army offensive as far forward as Eupen. Kaschner had planned to shift his attack later in the day toward Monschau, but this attack never was made. The bloody failure at Höfen gives a more than adequate explanation. German dead literally were piled in front of the 3d Battalion. The disparity in losses suffered by the combatants is amazing. The German dead counted in and around Höfen numbered 554; prisoners numbered 53. The American casualties were five killed and seven wounded. From this time on the 326th Volks Grenadier Division abandoned all but minor action in this sector, finally turning south to take a secondary role in the ensuing battle at the Elsenborn ridge. Höfen and Monschau remained in American hands through the rest of the Ardennes Campaign. At 1800 on 18 December the V Corps commander attached General Lauer's 99th Division to Robertson's 2d Division. General Gerow's instructions, given Robertson late on 17 December for a defense of the Rocherath-Krinkelt-Wirtzfeld line until such time as the isolated American troops to the east could be withdrawn, finally were fulfilled on the night of 18-19 December when the remnants of the 1st Battalion of the 393d and the 2d Battalion of the 394th came back through the 2d Division lines. These were the last organized units to find their way to safety, although small groups and individual stragglers would appear at the Elsenborn rallying point for some days to come. Then, despite the fact that the 2d Division was hard pressed, Robertson made good on his promise to the corps commander that he would release the 99th Division elements which had been placed in the 2d Division line and send them to Elsenborn for reorganization within their own division. The tactical problem remaining was to disengage the 2d Division and its attached troops, particularly those in the twin villages, while at the same time establishing a new and solid defense along the Elsenborn ridge. 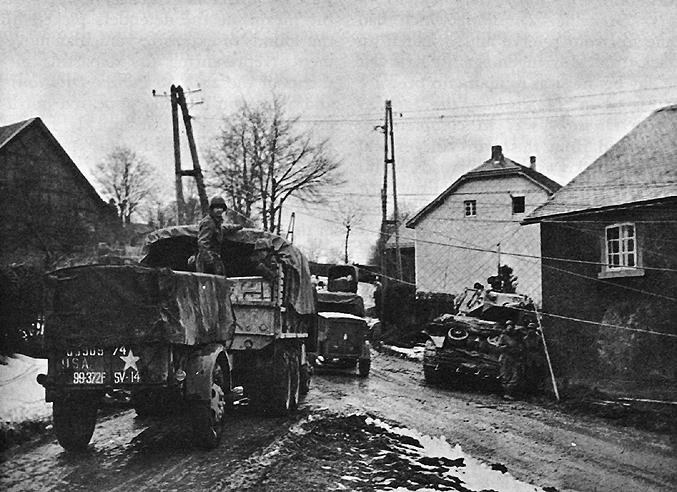 99TH DIVISION VEHICLES MOVING THROUGH WIRTZFELD en route to Elsenborn. Krinkelt-Rocherath front. But exhortation had been fruitless. Although Dietrich continued to needle his subordinates to get the right wing of the army rolling forward, he also sought to remedy the situation by changing the I SS Panzer Corps tactics. Dietrich suggested to General Priess that the 12th SS Panzer Division disengage, swing south, bypass Butgenbach, and get back onto the main route some place west of the thorny American position The I SS Panzer Corps commander and his staff politely rejected this idea on the grounds that the byroads were impassable and that Krinkelt, Rocherath, and Butgenbach must be cleared to open the better road net. 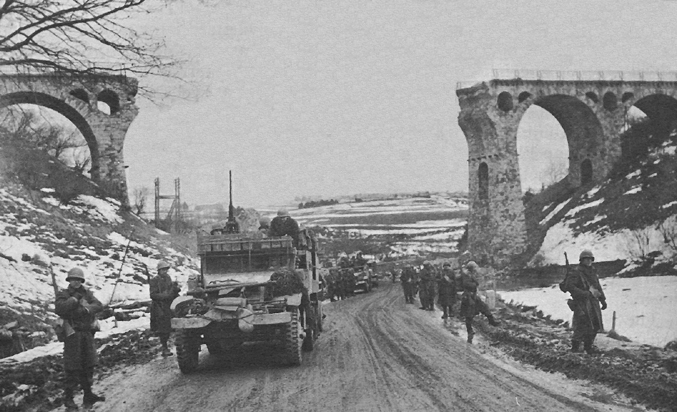 Eventually Dietrich prevailed-or some compromise was reached-for late on 18 December armored elements of the 12th SS Panzer Division began to withdraw from the twin villages, while the 3d Panzer Grenadier Division, which had been scheduled for the fight at Monschau, marched west from reserve to take over the battle with the 2d Division. Rocherath; the 89th Regiment, 12 Volks Grenadier Division, which had come up from reserve and initiated an attack from Mürringen against Krinkelt the day before, was to maintain pressure in this sector. Meanwhile, the 12th SS Panzer Division was to complete its withdrawal from the twin villages and move as quickly as the poor roads would allow to join a kampfgruppe of the 12 Volks Grenadier Division in a thrust against the American flank position at Butgenbach. The direction of the German main effort, as a result, would shift, substituting an armored thrust against the flank for the battering-ram frontal attack against the now well-developed defenses in the area of Krinkelt-Rocherath. Fresh German infantry were en route to the twin villages, and some reinforcements would be employed there on the 19th, but the attack would lack the armored weight whose momentum had carried earlier assault waves into the heart of the American positions. At dawn, on 19 December, and blanketed in thick fog, the German grenadiers advanced on Krinkelt and Rocherath. The batteries back on Elsenborn ridge once again laid down a defensive barrage, ending the attack before it could make any headway. Another advance, rolling forward under an incoming fog about 1000, placed enemy snipers and machine gunners close to the American positions. Shortly after noon a few German tanks churned toward the villages and unloaded machine gunners to work the weapons on derelict tanks which had been abandoned close to the American foxhole line. Apparently the enemy infantry were edging in as close as they could in preparation for a final night assault. Headlong assault tactics were no longer in evidence, however. In the meantime the defenders picked up the sounds of extensive vehicular movement (representing the departing elements of the 12th SS Panzer Division), and a platoon of tanks appeared northeast of Rocherath but quickly retired when artillery concentrations and direct fire were brought to bear. Inside the twin villages' perimeter the defenders were aware that a phase of the battle was ending. Colonel Stokes, the assistant division commander, was preparing plans for withdrawal to the Elsenborn lines. Colonel Boos had the 38th Infantry and its attached troops at work quietly destroying the weapons and equipment, German and American, which could not be evacuated. Finally, at 1345, the withdrawal order was issued, to be put in effect beginning at 1730. The 395th Infantry was to retire from its lines north of the villages and move cross-country (by a single boggy trail) west to Elsenborn. The 38th Infantry and its attached units, more closely engaged and in actual physical contact with the enemy, would break away from the villages, fall back west through Wirtzfeld, then move along the temporary road which the 2d Division engineers had constructed between Wirtzfeld and Berg. Once the 38th had cleared through the Wirtzfeld position, now held by elements of the 9th Infantry and a battalion of the 23d, it would occupy a new defensive line west and northwest of Wirtzfeld, while the 9th Infantry in turn evacuated that village. was to be "a move to new positions"; all were to walk, not run. Col. Leland W. Skaggs' 741St Tank Battalion, tank destroyers from the 644th Tank Destroyer Battalion, and the 2d Division engineers would form a covering force in the villages, laying mines and beating off any attempt at "pursuit." 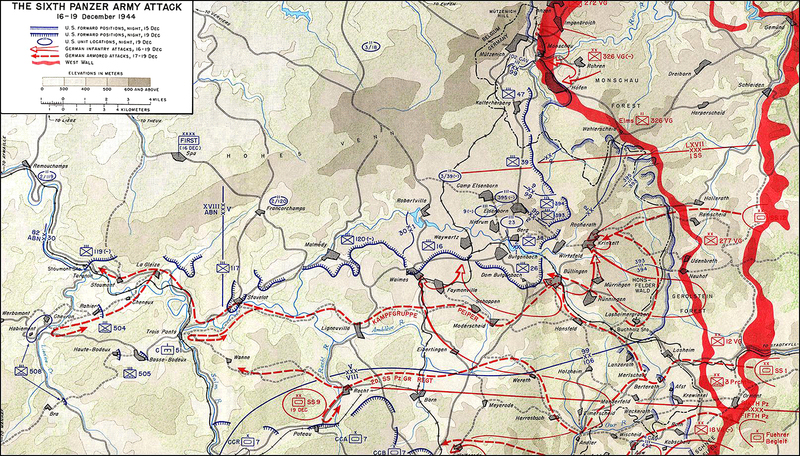 Disengagement was made from left to right, "stripping" the 2d Division line from Rocherath to Wirtzfeld. First, the 2d Battalion of the 38th Infantry pulled out of the north edge of Rocherath; the 1st Battalion, deployed in both villages, followed; the 3d Battalion tacked on at Krinkelt. A half hour later, just as the Germans moved into Rocherath, Company C of the 644th and Company B of the 741st hauled out, the tanks carrying the engineers. The move through Wirtzfeld, now in flames, brought the 38th under German guns and resulted in some casualties and confusion, but at 0200 on 20 December the rear guard tank platoon left Wirtzfeld and half an hour later the 9th Infantry passed through the new lines occupied by the 38th Infantry a thousand yards west of the village. The four-day battle which had pitted the 2d Infantry Division and the 99th Infantry Division against the spearheads of the Sixth Panzer Army had cost both sides heavily in men and materiel. But in the balance sheet for this desperate initial phase of the German counteroffensive, where lives weighed less than hours won or lost, the reckoning was favorable to the Americans. What the fruitless bid for a quick decision had cost the Germans in terms of dead and wounded has no accounting. The losses of the untried 99th Division, fighting its first major action under circumstances far more difficult than was the lot of most American infantry divisions in the European Theater of Operations, have been compiled only as a total for the whole month of December. A careful check shows that the 99th had few casualties prior to 16 December or after 19 December; nine-tenths or more of the following list, therefore, represents the cost of four days of battle: 14 officers and men killed in action; 53 officers and 1,341 men missing in action; 51 officers and 864 men wounded in action. About 600 officers and men passed through the division clearing station before 20 December as nonbattle casualties; half were trench foot cases. high incidence of nonbattle cases in a veteran unit whose ranks are filled with troops previously wounded or hospitalized-often more than once. The bitter character of the initial twenty-four hours of the 2d Division fight to occupy and hold Krinkelt and Rocherath, after the march south, is mirrored in the battle losses taken by the 38th Infantry in that critical period: 389 officers and men were missing (many of them killed in action but not so counted since the Americans subsequently lost the battleground); 50 wounded were evacuated; and 1l were counted as killed in action. In the three days at the twin villages the 38th Infantry suffered 625 casualties. firing battalions on Elsenborn ridge and the rifle companies in buildings and foxholes functioned when needed-although the losses suffered among the artillery forward observers were unusually high. Artillery throughout this fight offered the first line of antitank defense, immobilizing many panzers before they reached the foxhole line, leaving them with broken tracks and sprocket wheels like crippled geese in front of the hunter. The 155-mm. batteries were best at this work. The accuracy and weight of the defensive concentrations laid on from Elsenborn ridge must also be accounted one of the main reasons the American infantry were not completely overrun during the night assaults of the 17th and 18th. One battalion of the 2d Division artillery (the 38th Field Artillery (fired more than 5,000 rounds on the 18th. But men counted as much as weight of metal. Of the 48 forward observers working with the 15th Field Artillery Battalion, 32 were evacuated for wounds or exposure in six days of battle. Although an experienced outfit, the 2d Infantry Division made its first fight against a large force of tanks in the action at Krinkelt-Rocherath. In the early evening of 18 December General Robertson telephoned his assistant division commander: "This is a tank battle-if there are any tank replacements we could use them as crews are pretty tired. We could use the tanks mounting a 90m. [gun]." Robertson's wish for an American tank with adequate armament to cope with the German Panthers and Tigers was being echoed and would be echoed-prayerfully and profanely-wherever the enemy panzer divisions appeared out of the Ardennes hills and forests. What the 2d Division actually had was a little less than a battalion of Sherman tanks mounting the standard 75mm. Gun, a tank weapon already proven unequal to a duel with Panther or Tiger in head-to-head encounter. It must be said, however, that the 2d Division tank support came from a seasoned armored outfit-the 741st Tank Battalion-which had landed at OMAHA Beach on 6 June and had been almost constantly in action since. Unable to engage the 12th SS Panthers and the GHQ Tigers on equal terms in the open field, the Shermans were parceled out in and around the villages in two's and three's. Hidden by walls, houses, and hedgerows, or making sudden forays into the open, the American tankers stalked the heavier, better armed panzers, maneuvering under cover for a clear shot at flank or tail, or lying quietly in a lane until a Panther or Tiger crossed the sights. bazookas, fires were started to light dark streets and alleys, and many of the Germans boldly used their searchlights. These tactics failed; illumination served the waiting American tanks as well as the enemy. German bazooka teams did succeed in knocking out a pair of Shermans but generally found the American infantry, dismounted tankers, and tank destroyer crewmen, waiting to erase the walking infantry screens. The American tank destroyers shared honors with the tanks in this battle, but as it often happened in the Ardennes the fight had to be carried by the self-propelled guns, the towed guns serving mostly as convenient targets for the enemy. The 644th Tank Destroyer Battalion (minus one company) employed its self-propelled 3-inch guns with such effect as to destroy 17 tanks, disable 3, and knock out 2 German assault guns. Two guns of the battalion were damaged beyond recovery. Most of these kills were made in or near the villages against enemy tanks which had halted and were not firing, at ranges from 25 to 1,000 yards. In some instances one round of high-velocity, armor-piercing ammunition was sufficient to set a Panther aflame; generally two or three rounds with base detonating fuzes were needed and, as the Sherman tanks had found, direct hits on the German frontal armor or mantlet had the unpleasant habit of glancing off. The experience of the 801st Tank Destroyer Battalion, a towed outfit, was markedly different. Emplaced close to the infantry line, its 3-inch guns were brought under intense shelling and could be moved only at night. During attack, bogged in mud and unable to shift firing positions, the towed tank destroyers quickly fell prey to direct fire or infantry assault. Between 17 and 19 December the 801st lost 17 guns and 16 half-tracks. Indeed, the greatest combat value of the towed battalion came from the mines carried on the half-tracks (which were used with effect by adjacent riflemen) and the employment of the gun crews as infantry. On the afternoon of 18 December, with guns and vehicles gone, the bulk of the battalion was ordered to Elsenborn. Even so there were a few instances when the towed guns were able to fight and make kills under favorable circumstances. One gun from the 801st had been placed to cover a straggler line in the vicinity of Hünningen and here, deep inside the American position, surprised and knocked out four Mark IV's before it was destroyed. enemy armor was using. In the first contact at the crossroads east of Rocherath the German tanks were halted by a hasty mine field, but the rifle company made its most effective use of this defense by laying mines to protect the rear of the American position after the tanks had rolled by. The bazooka in the hands of the defending infantry proved extremely useful. During the dark hours, bazooka teams were able to work close to their prey under the cover provided by walls, houses and hedgerows. But, as in the case of the tank destroyers, most hits were scored against tanks which had paused or been stranded by the detonation of mines and high-explosive shellfire. In the various melees at the villages the German tank crews seldom escaped no matter what weapon was used against them. Most crewmen were burned as the tank blew up or they were cut down by bullet fire at close range. The 2d Division, like most veteran divisions, had armed itself beyond the limits of approved tables of equipment. Nearly every rifle platoon, as a result, had at least two bazookas, so that team play to distract and then destroy the target tank was feasible. in this sector saw little American use of the bayonet. Small arms and light machine guns took over where the friendly artillery left off, followed by grenades and rifle butts when the enemy closed. The problem of illuminating the scene of battle was partially solved by burning buildings and tanks. Illuminating shells fired by the 60-mm. mortars had some local usefulness, but the precise coordination between infantry and artillery required for the effective use of star shell never was achieved in this battle. On 19 December German General Staff officers from the high headquarters of WFSt and OB WEST appeared in the battle zone to peer over the shoulders of the combat commanders and diagnose the irritating failure to achieve a complete breakthrough. The conclusions they reported (which obviously took no official account of stubborn American resistance) were as follows. The check sustained in this sector could not be attributed to intervention by Allied air, an interesting reflection of the importance which Allied air-ground cooperation had assumed in German tactical thought by the end of 1944. The road net opened by the advance on 16 December had not been put in good repair. This the observers attributed to a breakdown of the para-military Todt Organization, whose labor groups were charged with the mission. Since the whole concept of the Todt Organization reached high into the realm of Nazi politics and personalities, this open animadversion is surprising and undoubtedly caused some consternation. The chief source of failure, said the General Staff observers, was the inadequate training of the troops who had been used in the attack. The conclusion reached as to the future conduct of operations on the Sixth Panzer Army front was simple enough and in accordance with established German doctrine: more maneuver room must be secured so that the attack could "unfold"; the entire Elsenborn area, therefore, must be won and at once. The right wing must be brought abreast of the 1st SS Panzer Division, at this moment twenty miles to the west of Stoumont. This new plan, probably only a reflection of conclusions already reached in the higher echelons, actually had gone into effect on 19 December when German tanks and infantry made the first serious attempt to drive northwest from Büllingen, shoulder the Americans out of the Butgenbach position, and open the Büllingen-Malmédy highway. and established that it still belonged to the Germans. The 26th Infantry held a none too favorable position. It was separated from its own division and could expect little help from the 99th, under which it had occupied Butgenbach, or from the 2d Division. Isolated action as a regimental combat team, however, was not unknown in the regiment's history for it had been so committed in North Africa during the Kasserine fight and at Barrafranca in Sicily. Although the lake reservoir gave some protection on the left flank the position held by the forward battalion, the 2d, protruded beyond this cover. The regimental right flank was bare-at least no infantry had been brought in to solidify this section of the line-and in theory the 26th Infantry was responsible for the defense of the four miles to the west between Butgenbach and the town of Weismes. Colonel Daniel's 2d Battalion, sticking out like a sore thumb ahead of the rest of the regiment, had arrived from the north in a depleted state, a condition endemic throughout the 26th as a result of the very heavy losses sustained during the 1st Division attack toward the Roer River early in December. There, on the fringe of the Hürtgen Forest, Companies E and F had been virtually annihilated, Company G shattered. Now the 2d Battalion rifle companies were nine-tenths replacements and numbered not more than a hundred men apiece. All told there were only seven officers in the battalion who had been on the roster at the beginning of December. 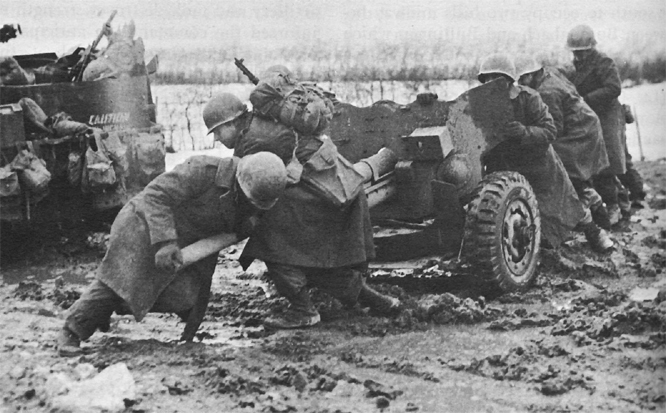 Two of the heavy machine gun platoons were manned by inexperienced gunners. There was a shortage of BAR's and grenade launchers. Fortunately, however, the 2d Battalion had been given ample time to prepare for defense. The rifle platoons had dug deep, covering the holes with logs and sandbags; wire was in to the 33d Field Artillery Battalion, emplaced to give support; and the artillery observers were dug in well forward. During the night of 18-19 December the I SS Panzer Corps gathered in Büllingen the advance striking force designed for the attack against Butgenbach. It appears too that the forward command post of the 12th SS Panzer Division opened in Büllingen to direct the coming fight. At least one battalion of the 25th SS Panzer Grenadier Regiment had arrived, plus a few tanks. The bulk of the division kampfgruppe which had fought at the twin villages was coming up by way of Losheimergraben. The tanks had an especially hard time on the road, which had been reduced to a river of mud (German officers later reported tanks along the route which had churned down nearly to their decks). In addition to the advance detachment and reconnaissance units of the 12th SS Panzer Division, the Büllingen force was swelled during the night by the 27th Fuesilier Regiment and 12th Fuesilier Battalion, both of the 12 Volks Grenadier Division, but the ranks of the latter units had been severely reduced during the fight for Losheimergraben. could reach the American line; others were discouraged by bazooka and battalion antitank gunfire. Three tanks, however, kept on along the road leading into Dom Butgenbach until the 155-mm. howitzers of the 5th Field Artillery Battalion began to lob HE uncomfortably close. Possibly crippled by concussion, the tanks were abandoned but the crews got away. The next German attack, at 1010, consisted of attempts in company strength to find weak points in the 1,800-yard line occupied by the 2d Battalion. One of these, against Company G, was broken up by shells fired in by four battalions of field artillery. A Panther and an armored scout car got through. Then a 57-mm. antitank gun crew crippled both, but the scout car got off one round that killed the crew, Cpl. Hale Williams and Pvt. Richard Wollenberg. However, the armored threat was ended at this point. On the east flank two of the battalion's antitank guns got the two leading tanks, and machine gun and mortar fire drove off the accompanying infantry. This action ended the first German attempt at cracking the Butgenbach block. The next would wait upon the assembly of the troops and vehicles slowly gathering at Büllingen, where the II SS Panzer Corps had taken over direction of the battle. On 18 and 19 December the 3d Parachute Division, which had been following in the wake of the 1st SS Panzer Division westward, began to concentrate south of Weismes. It may be that the 3d Parachute Division thus far had received no orders as to the projected widening of the Sixth Panzer Army corridor of advance and was content with holding a blocking position along the German flank as originally planned. 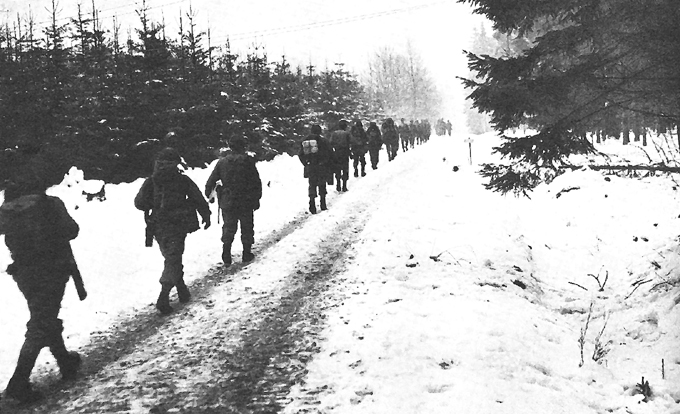 As it was, American reinforcements arrived in the Weismes area on 19 December before the enemy struck. The 16th Infantry (Col. Frederick W. Gibb) was the second regimental combat team of the 1st Division to take its place in the barrier being erected on the northern shoulder of the expanding German salient. The 2d Battalion, leading the south-moving column, was well set in Weismes when, in the late afternoon of 19 December, the 3d Parachute Division commenced desultory jabs at the village. At the same time the balance of the 16th Infantry detrucked and swelled out the Weismes front, making contact to the west with troops of the veteran 30th Infantry Division which had just come into the Malmédy sector. By the evening of 19 December, then, the 1st Infantry Division had neighbors on either flank and its 26th Infantry, although still out in front, could concentrate on the enemy force building up at Büllingen. rolled off the roads and into Dom Butgenbach. (They had shot down three bazooka teams and a Company H machine gun section.) Here, in the dark, battalion antitank guns placed to defend the 2d Battalion command post went to work firing point-blank at the exhaust flashes as the German vehicles passed. Two enemy tanks were holed and the rest fled the village, although the antitank gun crews suffered at the hands of the German bazooka teams that had filtered in with the tanks. A second try came just before dawn, this time straight down the road from Büllingen. Ten German tanks in single file were sighted as they came over a slight ridge to the front of Company F. Two tank destroyers and three antitank guns drove the tanks off or at least caused them to turn west in search of a weaker spot in the 2d Battalion defenses. In the next thrust a platoon of Company G was badly cut up before friendly artillery finally checked the attack. Fifteen minutes later, apparently still seeking a hole, the Germans hit Company E, next in line to the west. The 60-mm. mortars illuminated the ground in front of the company at just the right moment and two of three tanks heading the assault were knocked out by bazooka and 57-mm. fire from the flank. The third tank commander stuck his head out of the escape hatch to take a look around and was promptly pistoled by an American corporal.10 By this time shellfire had scattered the German infantry. Nor did the enemy make another try until dusk, and then only with combat patrols. The hardest blows dealt the 2d Battalion defenders at Dom Butgenbach came on 21 December. After repeated pleas from the 12th SS Panzer the guns and Werfers which had been used at Krinkelt-Rocherath were committed, and the entire 25th Panzer Grenadier Regiment was also made available, as well as one battalion or more of the 12th SS Panzer Regiment. About three hours before dawn guns, mortars, tanks, and Werfers began pounding the American foxhole line, which was outlined by a double row of trees, and the few houses in Dom Butgenbach. This fire continued unremittingly until the first light in the east, inflicting many casualties, destroying weapons by direct hits, and tearing large gaps in the main line of resistance. American counterbattery fire was intense but failed to still the enemy shelling. Now, as the Germans crossed the fields in assault formation, the American forward observers called for a defensive barrage to box their own front lines. At least ten field artillery battalions ultimately joined the fight (for this batteries of the 2d and 99th Divisions were tied into the 1st Division fire control system) and succeeded in discouraging the German infantry. the guns of the 2d Platoon.11 At this segment of the 2d Battalion main line of resistance the foxhole line followed a long hedgerow. Having broken through and destroyed the American antitank guns, the German tankers drove along the hedgerows searching out the automatic weapons which earlier had helped check the infantry assault. Undefended against moving steel, the BAR and machine gun crews were wiped out. Through this gaping hole on the 2d Battalion right more tanks appeared as the morning progressed and moved down the slope toward Dom Butgenbach. A self-propelled tank destroyer belonging to the 634th Tank Destroyer Battalion accounted for seven tanks in succession as these, in column, hove in sight over the ridge line. Two Sherman tanks, lying close to a barn, got two of the Germans before they, in turn, were knocked out. Three of the enemy reached the cluster of buildings and fired pointblank into the houses and barns Colonel Daniel and the 2d Battalion command post group were defending. Every device was used to reach the tanks but with no success until, finding it warm, two made a break for the open and were stopped by a section of 90-mm. tank destroyers which had just come up. The last tank was flushed out from behind a barn by 81-mm. mortar fire but got away. when it arrived to face the Germans, had been reduced by perhaps one quarter. Indeed, in midafternoon of the 21st, the battalion commander had planned withdrawing a thousand yards to the rear to compensate for the dwindling strength in the firing line. But when the 2d reorganized that evening its position was somewhat strengthened. Company C, with extra bazookas, had come up to man the denuded right flank, the 1st Engineer Combat Battalion laid a hasty field of about a thousand mines in front of the lines, and the regiment had attached the 4.2-inch mortars of the 2d Division chemical battalion to Daniel's command. Meanwhile the enemy regrouped to continue the attack with new forces. The armored infantry reserve of the 12th SS Panzer Division, the 26th Panzer Grenadier Regiment, finally had negotiated the poor roads and traffic jams along the German line of communications and arrived in Büllingen, ready for its first commitment in the offensive. Shortly after day broke on 22 December patrols from the 26th commenced to probe at the 2d Battalion lines. The fresh enemy regiment, however, set out to vary the unsuccessful headlong tactics previously employed by striking at the flanks of the Dom Butgenbach position. The first assault, shortly before 1000, carried an undetermined number of panzer grenadiers through a gap between Companies A and K, on the right of the 2d Battalion. Here there were about twenty Mark V's and tank destroyers, but the 90-mm. tank destroyers from the 613th Tank Destroyer Battalion rushed in on the flank and Stopped the enemy. The continued threat, though serious, was countered by shifting local reserves from the 18th and 26th to close the gap, and by the end of the day the situation was well in hand. Again the American gunners had taken over a large share of the burden, firing over 300 missions. The cooperation between the artillery and infantry arms, it must be said, was reciprocal. The fact that the 26th Infantry had continued to hold its position on ground overlooking the German routes west had allowed the observers a grandstand seat and had caused the German columns taking the 1st SS Panzer Division detour through Schoppen to run a gantlet of accurate and continuous fire. The successful withdrawal from the Krinkelt-Rocherath sector to the more favorable terrain of the Elsenborn ridge had resulted, by 20 December, in a fairly homogeneous and well-constructed defense with the 2d Division on the right and the 99th Division on the left. On the morning of this same day the 9th Infantry Division took over the Monschau-Höfen sector (its 47th Infantry had moved earlier into supporting position west of these two towns) and so covered the northern flank of the 99th. the subsequent attempts with heavy losses to the attacker. On the following day, the 3d Panzer Grenadier was caught by artillery fire just as its assault waves were forming. Confused and disorganized, the German infantry were unable to make another bid. During the night of 22 December an artillery bombardment prepared the way for German infiltration elsewhere on the 9th Division front. But when day broke the Americans drove the enemy back after a series of short fire fights and restored the line in its entirety. The 277th Volks Grenadier Division no longer possessed the strength to make a real effort against the north wing of the Elsenborn line. The 326th Volks Grenadier Division, its northern neighbor, had given no hand in this fight-not surprising in view of the punishment taken at Höfen and Monschau. Both divisions now fell out of the drive to widen the way west. 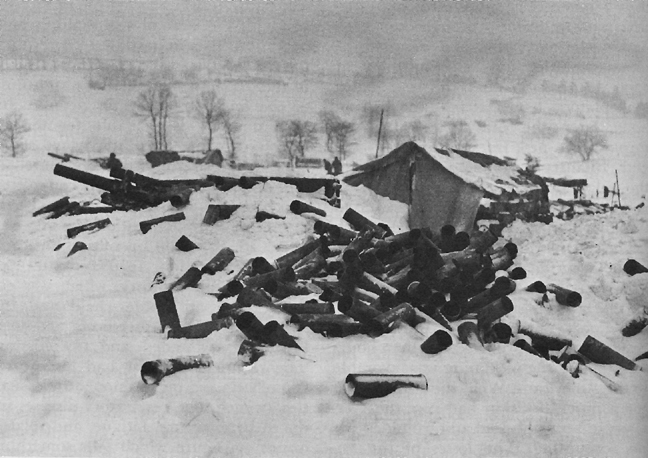 The surest signal of the failure on the right wing of the Sixth Panzer Army was the ignominious end of the attack in the Butgenbach sector On the morning of 23 December the 18th Infantry barred the gap which had opened the day before on the right of the 26th Infantry-and the 12th SS Panzer Division threw in the sponge. 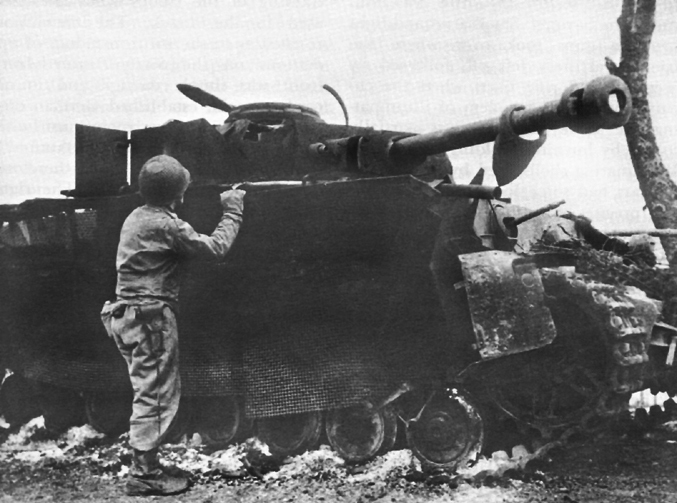 The American troops who had jammed the right shoulder of the Sixth Panzer Army knew they had made a fight of it. They could hardly know that they had knocked a part of Hitler's personal operations plan into a cocked hat. The elite SS panzer formations on which the Fuehrer so relied would continue to play a major role in the Ardennes counteroffensive but no longer would be charged with the main effort; this had passed on 20 December to Manteuffel and the Fifth Panzer Army.15 And if, as Manteuffel later suggested, the Fuehrer wanted to see an SS and a regular panzer army competing, it could be said that he had his answer.